Rooibos tea has gained popularity in America in recent years, as many want to take advantage of its many proven health benefits. The tea comes from the shrub Aspalathus Linearis, which is only found on the slopes of Cape of Good Hope in South Africa. While locals have been drinking this tea for hundreds of years, it only began being commercially traded in 1904, according to WebMD. It has a mild and aromatic taste; however, most drink it for its plethora of health benefits. It’s quite popular in Japan, Germany, Holland and England. According to WebMD, the tea has 50 times more antioxidants than green tea. These antioxidants are known to thwart free radicals in the body that can damage cells and cause cancer. It’s also rich in Vitamin C, low in tannins and may ease digestive problems. Other studies have shown the tea may help strengthen the bones and teeth preventing osteoporosis, fractures and other related illnesses. Many women in Japan drink this tea for its positive effect on the skin and hair. It has been known to clear skin of acne and prevent wrinkles. Because it’s caffeine free, it may be drunk without limit and won’t affect sleep cycles or cause insomnia as with some other popular teas. Finally, locals have even used it as a substitute for milk in colicky babies. 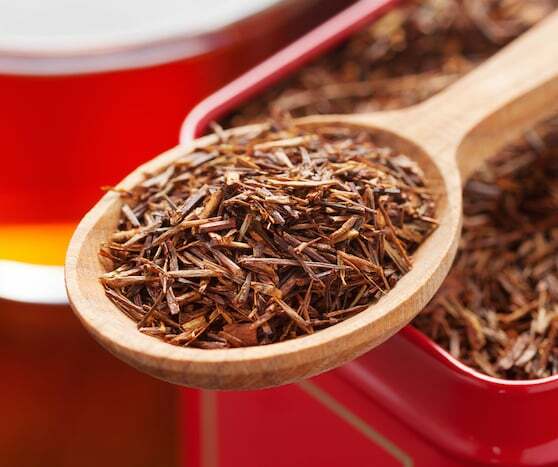 Anyone who has ever suffered from asthma, skin issues, eczema, insomnia, bone weakness or hypertension may want to consider drinking rooibos tea. The United States Department of Agriculture has confirmed many of the health benefits of drinking rooibos tea including its ability to reduce the risk of various types of cancer, heart disease and premature aging. It’s also a great tea to drink when suffering from stomach cramps or other digestive problems. Furthermore, the tea is rich in minerals that may help boost the immune system and keep the body healthy. It contains calcium, iron, potassium, copper, fluoride, manganese, magnesium, zinc and alpha hydroxy acid. Article by Aimable Johnson, from Dieting Well. Reprinted by permission. I have a couple questions: Is there a right and/or wrong way to brew rooibos tea? Is one type more nutrient-packed than another? Presently, I have green, pure red, very berry, orange spice, and lemon hibiscus, in my cupboard. I drink up the roiboos leaves as wel i feel great. My bowel movement is excellent and my hair and skin look wonderful at 55. I find swallowing the leaves something i cannot do without, hypertention treatment has been a thing of mouthtalk for the past 3years now. I improved from taking two different pills for HBP twice a day to taking nothing. I drink several cups of red roboos (swalloing the leaves) in a day as i also do not take fizzy or diluted beverages. I add milk ,put fresh lemon rings or take it plain. I don’t like sugar. I thank God for creating wonderful roboos every time i drink it. I ‘m up and about the entire day daylight time without feeling tired! Eullar, I also have a question about the leaves as I have high blood pressure and don’t mind the taste of roboos tea. Do you cut the leaves up or just chew them and them swallow them? In other words what is the best way to eat the leaves? I would appreciate your reply if possible thanks from Mark. Just open up the tea bag, put the contents into a mug and fill with water, then drink, including the leaves, swallow them whole or chew them up. Or just make a small hole in the tea bag so only a few leaves are able to escape. Not unless you want it for the taste, Nyikoane. Loved reading all the comments. Would like to know the best way to have the tea leaves. If I don’t drink a tea bag in a day I feel as if I want to fall sick; am I addicted or what? Azu, yes Rooibos tea is SO extremely potent and the world is so full of illness causing germs that missing one mere cup of Rooibos tea can result in one ‘falling sick’ by being infested with a myriad of viruses or bacteria. Were you able to score a nice bag of red tea so as to avoid running low on your stash in future and having to go cold turkey off the Rooibos? We can only hope and pray that your detox wasn’t long. I have just started drinking the Rooibos and love it. To gain the full benefits, on average how many tea bags or cups are recommended per day? Rooibos tea has NOT significant quantity of minerals per serve. It basically contains polyphenol and other antioxidants. How many cups per day to benefit from this tea? The health benefits of this tea, must be part of a healthy and varied diet. The antioxidants present can be added along with a multi hit and mineral supplement and a diet that is termed healthy : low sat fat,healthy unsaturated fats etc. No reason why you are limited to the amount you want; it’s all good. I was wondering if this is safe to drink while pregnant. Hello – with these kinds of questions, it’s always best to consult with your practitioner. Best to be on the safe side! Hi to all, l have have just started drinking Rooibos Chai tea made by Kintra foods it is organic and caffeine free and tastes great.lam in Australia and got it from IGA. Yesterday i accidentally had a cup of Roibos tea during the day and guess what? I had a solid 8 hours sleep after several years of sleeping 4-6 hrs. I’m now discovering the health benefits of this wonderful tea. As a long-time rooibus drinker, I would also recommend green rooibus for some variety. Red rooibus is darker due to it being dried and processed. Green is the same plant as Red, but not pre-dried. I consume both red and green (sometimes together). Some claim green is actually better for you, but I don’t think you can go wrong with either variety. Enjoy! I read somewhere that raibos tea also has some estrogenic properties. is it true? As a 70 year old male I’m concerned about how the estrogenic boost of rooibos tea will effect my testosterone levels. Had first cup of rooibus tea this evening and it’s WONDERFUL. Flavored with a little Stevia and it tastes heavenly. Can one become sick if you drink too much rooibus? I have been drinking 2-3 cups of rooibos tea each day for the past few months. It is amazing! I don’t catch colds and my skin looks great. I am going to order this tea tomorrow. I am glad I found it. I read in these comments that rooibos tea could have esterogen properties in it.I need to know one way or the other as I had estrogen related breast cancer amd must avoid anything estrogen related in my diet.Piease respond. Gigi, you should definitely consult with your health care professional. But for now, better to be safe, and use a different herbal tea. I am new to tea. A friend gave me Tea Guys, Pumpkin Caramel & Cinnamon. Main ingredient is Rooibos. Also others, a couple of herbs, spices and pumpkin seeds. Am I getting much benefit of the Rooibos? It was delicious.Thank you! Can I drink it while I’m pregnant? WHERE CAN I GET THE ROOIBOIS TEA. I bought some Rooibos Citronnelle Chinoise in Quebec in Canada and it tastes really nice. The lady in the tea shop recommended it to me. Thanks for the info on this page, I never realised it had so many benefits. Amazing – loved this page. Thank you Aimable Johnson and Nav Atlas. @Michael, you can buy Rooibos Tea on Amazon.com. There are loads there. The best options in my opinion are the pure Rooibos teas… not those with added bits of fruit…. (which you could do at home). Several asked about the optimum amount of tea to drink in a day. From the research I made it’s 6 cups a day. More won’t harm you. I found this other site only yesterday on Google while searching for Rooibos tea benefits… go here… aghh I can’t find it now, but it’s name was Rooibos Rocks… it certainly does! It’s just an awesome drink. In Britain there is a tea readilly available in supermarkets called “Redbush”.Is this the same as Rooibos Tea? Terand, hope you saw Nick’s response that Roibos is the same as Redbush. As far as the Thermogenic benefits, I don’t have enough knowledge to comment on that at all. Yes Roibos tea is the same as Redbush. Just another name for it. I am also in the UK & bought a box from Tesco. I also read somewhere a few days ago about Thermogenic benefits from Roibos which helps with weight loss. Can anyone else confirm that? 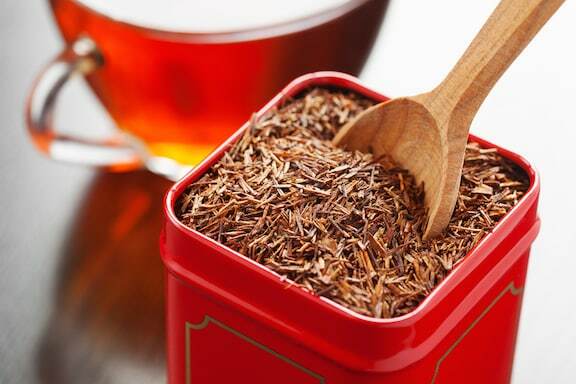 Hey Everyone, im from Cape Town South Africa nice read,thought i would share some input redbush is the direct translation from rooibos which is in afrikaans also Rooibos (Aspalathus linearis), pronounced roy-bosh, is a shrub-like bush with soft needle-like leaves. It grows only in the ruggedly beautiful Cederberg coastal mountains of South Africa, a protected World Heritage site some 200km north of Cape Town. It flourishes here because of the unique combination of climate and the specific PH balance of the region’s well-drained, sandy soil — all attempts to grow it beyond the magnificent Cederberg have failed. 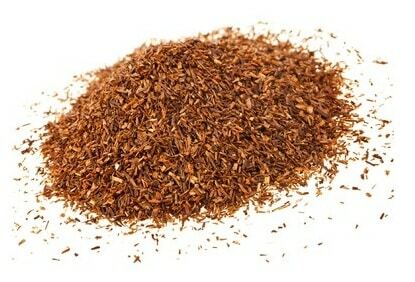 Contrary to popular belief, Rooibos is not a herb, but rather part of the indigenous Fynbos family. In the spring the plants put out tiny, yellow, pea-like flowers. Like all good teas the best flavour comes from plants grown at a higher altitude. I BREW A COMBINATION OF REDBUSH TEA AND GREEN TEA IN ORDER TO GET THE BENEFIT OF BOTH TEAS. BOTH TEAS ARE HIGH IN NUTRIENTS. CHECK MY PROFILE ON GOOGLE AND MY TWO VIDEOS ON YOUTUBE. I have been drinking Rooibos for 22 years and i will tell you i look 10 years younger and feel amazing as all the health problems I have growing up as a child have been more manageable since i started taking it..heart murmur, Asthma, fatigue, and many more it is not a cure it is something to boost and help with your condition what ever it is…it will help..and remember everyone is different so its effects can be immediate or long term but I know it works..and as for the dose i have it every day as many cups as i want and i love it if i am addicted to it what harm is it doing when it is so good for you…if you havent tried it then do so and you will know how i feel..
I’ve never had rooibos tea but it’s good to know that it’s packed with health benefits. Maybe I’ll try it someday. I’ve been drinking rooibos tea for over 5 years and am amazed at the benefits it has given to me. The overall effect has been transformative. I suffer from allergies and it was recommended to help alleviate them. I just started drinking it for about a week now and it taste good with our any sugars. I am reading all about it and look forward to some allergy relief. I am curious about fluoride. Is it natural in the tea or added? Where would u buy a raw version to brew? The fluoride is natural and yes fluoride is bad when ingested. I drink a lot of Rooibos regardless as I think the benefit outweighs the negatives. I Have started drinking rooibos tea about a month ago and I have seen a lot of improvements in my body.In fact,my skin is glowing and I am looking younger than my age.Thanks to rooibos tea. Flouride is a poison no matter how it occurs, for me it’s the only reason why I don’t drink Rooibos every day. It is a great tea though and I do enjoy it several times a week. As I don’t like caffeine it’s a nice option as a hot beverage on cold mornings. Rooibos tea is my life! I simply have to have a cup every single morning and in the evening before bed. I use the ingredients inside the sachet as a facial as I mix it with coconut oil and apply it to my face and keave for 10mins then rinse. Most amazing thing ever. i suggest drinking rooibos to anyone from all ages!!!! From a baby to a senior. Love love love all its benefits to my skin and healthy digestive system. Last week I stumbled upon Rooibos- tea while browsing on the healthy living tips website. I ordered 8oz because my hair is falling at an alarming rate, and I read the tea helps regrow hair.I\’m still waiting for my order. Farrah, I am a dental hygienist. No, fluoride is not bad for you. I have several patients who, unless they brushed with fluoridated toothpaste, drank fluoridated water, and took a fluoride supplement, would not have teeth at all because they have an enamel defect. Fluoride is good for prevention of dental decay as well. Just like Tylenol is good for headaches. You just don’t take the whole bottle! 😉 A person would have to injest a whole bathtub full of water without excreting any of it, in order to die from drinking fluoridated water. But by then, they would have died from drowning themselves before the fluoride in the water. About Rooibos, I just started drinking it and I saw one girl says she sprays her hair with it every day. She’s a redhead like me, so I’ve also started doing that. Can’t wait to enjoy the benefits of nice skin and hair among all the other benefits! Ummm, yep, Fluoride IS B A D for you. It makes teeth harder, but brittle. It also damages bones and helps to create brittle bone disease…-osteoporosis, as well as encrusts your pituitary gland…not good stuff! You all better tell the truth about everything. Is Rooibos Tea healthy for human consumption? I use it as a natural face toner every morning. Steep 2 tea bags in a coffee mug then leave in the fridge. I use until the cup is finished. I leave the tea bags in the cup. It really helped clear blackheads & pimples. It helped with dryness. My skin looked more radient after a few days. I also wash my face with organic honey. I will never use anything else on my face! Great combination. This tea is truly amazing. I have been drinking it for 1000’s of years, and I am beginning to believe it will give you eternal life! I got a box of this tea from someone who knows I love tea. I was hesitant since the box mentioned a hit of vanilla even though the tea was the only ingredient. I took one sip and was moaning with pleasure. After about five minutes of saying, ” Oh my gosh this tea is SO good!” after every sip I left my annoyed husbands side to research what in the world I was drinking. I’m so happy to see not only is it fabulous, it has so many benefits. Really sad to read it has fluoride. I’m anti fluoride and I am cavity free WITHOUT fluoride in my toothpaste and water. I am a dental hygienist, I have thyroid issues from hyper to hypo and do not use fluoride. Read Dr. Mercola’s article on Fluoride and it should answer all your questions. However I am going to try the tea and see how I feel. If you are looking for something to prevent cavities look up xylitol. I just bought this type of tea this week. It looks like it is beneficial but I will have to research more about the fluoride. I brew some rooibos (tropical flavour) and then wait until it cools and use that in my morning smoothie. It adds a little extra flavour than just using water and a lot of extra benefits. How many times a week should I take the tea? XYITOL IS POSIONOUS TO DOGS AND SOME OTHER ANIMALS! PLEASE be aware that even a tiny bit of Xyitol can kill a dog and dispose of very carefully! Anyone know if rooibos has any toxicity for other than human animals? I just bought my rooibos tea and i really like the taste…. hoping soon the good benefits of it…. Where do I buy rooibus tea? I’ve been drinking rooibos since I was an infant. I’m 34 years old and I’m alive and well. No health issues whatsoever and my dentist says my teeth are in perfect condition. Just do it. I just tried the Rooibos tea from Costco, it’s the good earth brand and it us awesome! The smell is amazing as well as the taste! Thanks for the tip, Tammy! There are dangerous things that people drink on daily basis such as alcohol. There is no harm in drinking rooibos tea. My grandfather has been drinking rooibos tea for many years without problems. I buy my Rooibos tea at http://www.chelmsfordtea.com, plain Rooibos as well as many great and natural flavors. Tasty… unfortunately, really gave my liver a whack. I’m probably a rare case. I have insomnia due to environmental illness and chemical sensitivities. I discovered quite by accident that rooibos tea helps me sleep, because whenever I happened to drink a cup in the evening, I slept better. Now I drink it intentionally most nights. I have no idea what in the tea helps me sleep, but I am so happy I discovered it! Just tried my first cup of rooibos tea and I really like it, however was alarmed to see fluoride as an ingredient. I don’t do fluoride. Is this a nature occurring substance from the plant or added? Please be honest! Hi Cathy. this is a really good question! The brand I use, Numi, doesn’t actually list fluoride as an ingredient because a small amount of naturally occurring fluoride is one of the minerals contained in this tea, much the same way as calcium and magnesium. I do find it odd that it’s listed as an ingredient, though. The naturally occurring fluoride is probably very different than the sodium fluoride added to drinking water and toothpastes — yet has similar benefits of protecting the bones and teeth. Do a google search on “rooibos tea fluoride” but do be aware that there is a lot of misinformation on the web. Compare several articles, and make the decision you feel is right for you! Its a great tea. Started drinking it while in S.A. and continued it when back in the states. I have been drinking it on a regular basis. Atleast 2-3 times per day for the last 8 years. Apart from great taste, it helps me sleep better. I started drinking this tea and now my liver enzymes are high. My doctor seems to think it is this tea!! She has asked me to stop drinking it and will be retesting my blood. Noticed another reader said he had liver issues too. Anyone else had this problem?? I love tea in general but caffeine gives me a feeling of anxiety with heart palpitations. Roobois is my tea to go to. The flavor is awesome. I drink at least once a day. I guess that’s why I never seem to age!! I love this tea, I put TWO bags in a coffee cup and leave them both in the cup whilst I drink it. I drink it everyday, I’m 78 and see my doctor ONCE a year for check-ups! i love love this tea, i drink at least 3-4 cups a day, and always one before i go to bed it seems to relax me and i fall right to sleep.i am 66 years old and people tell me all the time i do not look that old, what makes me feel good. Long time reader, first time commenter, here! I’m 25, drink rooibos tea more often than I used to and am looking fantastic! Thanks for reading! My husband and I love it! I need to find out where to purchase it. Starbucks ended its relationship with Oprah’s tea…I’ll find it! Vivian, I get Numi Rooibos Tea at my local natural foods store … I’m sure you could find it on Amazon.com or other online outlets as well. Stash makes a chai version that is great! I found it at Wal-Mart. I just found Arbor Teas, an organic tea company in Michigan. They sell all kind of organic teas. Their rooibos Tea is excellent. They sell loose leaf teas. And that is the best kind! I just bought some at Walmart. Boil for 6 minutes add honey and drink. Simple. Just a correction to the introduction. Rooibos tea only grows in a very specific region in the Western Cape South Africa, it’s found in a region called the Cederberg. This tea is so phenomenal yet the people in that region are so poor. It’s really sad that something so phenomenal does not create the kind of wealth one would expect. A good tip is to pop 8 tea bags in your bath water, absolutely brilliant for the skin. Thanks for this info, Lyndon — very interesting and useful! I also love it and drink it but only at night. It makes me sleep. What can I say about Rooibos, it is my cure for many things: Put 2 bags of rooibos into a heat resistant jug, fill up with hot water and leave to cool. Put it in the fridge. You can then use it for many things. I use it as a face cleanser every day, I don’t wash it off. Many people remark at how good my skin looks and I haven’t had any problems with pimples since doing this. I have been doing this for many many years now. For hair, after washing and conditioning pour rooibos onto your scalp, don’t rinse. I have coloured red hair and it makes the colour look good and keeps the hair in good condition. It does help with dandruff and hair loss. For mouth ulcers gargle with it, the ulcers go for very quickly. Lastly for animals with weepy eyes put a bit of rooibos on cotton wool and wipe the eyes do this 3 times a day and it quickly disappears. My family thinks I am crazy but it really works for many things and it is my go to miracle curer. Celestial Seasonings sells it. There is a picture 0f a Lion drinking tea from a tea cup. But, they only stock it around the first of the year in Sandpoint Idaho. Super 1 and yokes has carried it. I now stockpile it so I can have it through out the year. I get organic Red Rooibos from Harmonic Arts Botanical Dispensary. Great service and people with wonder-filled herbs! I used to get it from Mountain Rose Herbs but it’s more costly as I’m in Canada. I mix the Red Rooibos with Rose Hips and Hibiscus. It’s delicious hot or cold. and super healthy! Since rooibos is so powerful, it can interfere with treatments for various conditions, including chemotherapy for cancer patients. it might not be a good idea to use if you have a hormone-sensitive cancer like breast cancer. Finally, if you have existing kidney or liver conditions, rooibos might be more harmful than helpful. It should be used as a preventative measure for these conditions, not a cure. I am going to be a first time user this evening. I bought it mainly for inflammation. I was going to have my husband try it also, but he has very low blood pressure due to medications. If you have low blood pressure you mostly should not be using rooibos. Fluoride is not a mineral the body uses. Fluoride is a toxin. I just love the taste. Had no idea it had so many health benefits. I make ice tea during the day and have a hot cup at night. I do sleep a lot better now that I have added it to my nightly routine and I have had problems sleeping for as long as I can remember. Hope it benefits the hair as indicated as my hair has been thinning a lot lately. My favorite is African Solstice from Teavanna but I drink “my red tea” Organic rooibos because it is more budget friendly (from Amazon) and they give a percentage f profits back to the farming community. Fascinating article! I have just started drinking Roobois in combo with a losse leaf raspberry mix – as my Gp has advised against regular tea due to migranes. Please can somebody tell me at what temperature it should be heated ideally? I don’t want to pastorise it. Thank you. Hi, Thanks for sharing the health benefits of Rooibos Tea. I was always having the green tea and was aware of its benefits. Looks like Rooibos Tea is much better than green tea. Will try this. Being South African i grew up drinking this tea, all i can say is that it most definitly has helped me all my life. As a teenager my skin was spotless and clear, i never suffered from cellulite and even now as an adult and Mom of two – my daily routine never excludes rooibos. Other than that its great for traeting eye infections in infants as well as nappy rash! Well, I just got the Rooibos tea, I’m looking forward to try it. I hear good things about Rooibos Tea. I hope it works for my anxiety and my weight. And my other health issues. Wow! I didn’t know that Rooibos had more antioxidants than green tea! I also didn’t know that it was good for calming. I used to drink it but then started drinking more coffee than teas. This article and the comments have convinced me that I need to go back to drinking tea. I will keep everyone posted on my progress. Great benefits. Does it happen to everyone but when I drink it, I pee a lot. Is it a good thing or not? I have always loved drinking hot drinks like tea, but I had no idea that rooibos tea has so many health benefits! I like that you say it is anti-inflammatory as well as revealing hypertension. Also, I did not know that it contains calcium and fluoride that will help to promote healthy bones and teeth. Thank you for sharing these benefits! I could not find on WebMD where “the tea has 50 times more antioxidants than green tea. These antioxidants are known to thwart free radicals in the body that can damage cells and cause cancer.” Entered Rooibus into the search produced no results. Wow that’s great article. I specially want to thanks Vegkitchen.com as well as Aimable Johnson to provide such an informative article. I have drunk several time rooibos tea but it was not known to me about the positive effect of rooibos tea. Specially I did not know that who has ever suffered from asthma, skin issues, eczema, insomnia, bone weakness or hypertension may want to consider drinking rooibos tea. So I can suggest someone who never know about the positive thing of rooibos tea.